Make star-spangled drinks with star-shaped ice. Photo courtesy Promo-Wholesale.com. It’s the little touches that make guests smile. Like star-shaped ice in their July 4th drinks. 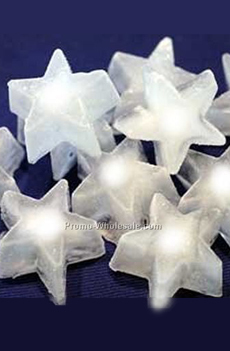 Make each soft drink or cocktail more special with star-shaped ice, made in a silicon mold. No time to find ice cube trays? Head to the market for carambola, star fruit, to garnish the rims of glasses. Then, find some special cocktail recipes. American Flag Cocktail: Individual red, white and blue tequila shots. Recipe. Fruit Cocktails: Red, white and blue cocktails made with blueberry purée, peach purée and raspberry purée.Recipe. Sangrita: Tequila, triple sec and ginger ale with white ice cubes and blueberries. Recipe. The red sparkler has a base of cranberry juice, the white is plain and the blue uses blueberry juice. Add two inches of juice to a Champagne flute and top with the sparkling wine. Don’t stir: It breaks up the bubbles. You can make a non-alcoholic version with with lemon-lime soda.